I grew up in Pittsburgh, which is only an hour north of a most beautiful region known as the Laurel Highlands. In the past 3 or 4 years I've been (re)discovering fantastic places that were practically in my backyard, yet I rarely experienced until after I moved to Columbus. As a child, we went to Idewild Park and Seven Springs Ski Resort, but a 10-year old has no concept of distance. I had no idea how much fun there was, so close by! As an adult, I've come to appreciate how easily accessible the Laurel Highlands is from lots of cities, including Columbus. The Laurel Highlands is a sprawling region, straddling the Pa. turnpike and includes some fabulous attractions, such as Seven Springs Mountain resort; Fallingwater; Kentuck Knob; Nemacolin Woodlands; Idewild Park; Fort Ligonier; and Fort Necessity- a national battlefield. The outdoor offerings are even more plentiful: state parks, the Great Allegheny Passage and one of the world's top ten rafted rivers. 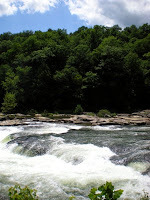 The village of Ohiopyle, located on the Youghiogheny River, is a popular launching point for all sorts of outdoor adventures, including white water rafting of all levels. There's a couple of little cafes and bars, and plenty of liverys, outdoorsy shops and access to hiking and biking trails. The picture at the top is of Cucumber Falls, an easy photo-op along the winding road, and also a popular fishing hole. When driving from Columbus, we usually take I-70 East then hop off on Route 40 somewhere along the way, for a more leisurely drive into the Highlands. The National Road (a.k.a. Route 40), snakes through Ohio and into southwestern Pennsylvania, past quiet towns and idyllic landscapes. If you blink, you might miss Scenery Hill, where the historic Century Inn (c.1794) has been feeding and bedding weary travelers for two centuries. It is not in the Laurel Highlands 'proper' but as one of the country’s oldest continuously operated taverns is certainly worthy of mention. Also, it’s not surprising that several of our nation’s great leaders took a meal and a drink here: George Washington, Andrew Jackson and James Polk to name only the presidents. The golden stone building, which served as a stagecoach stop throughout the 19th century, is brimming with antiques. 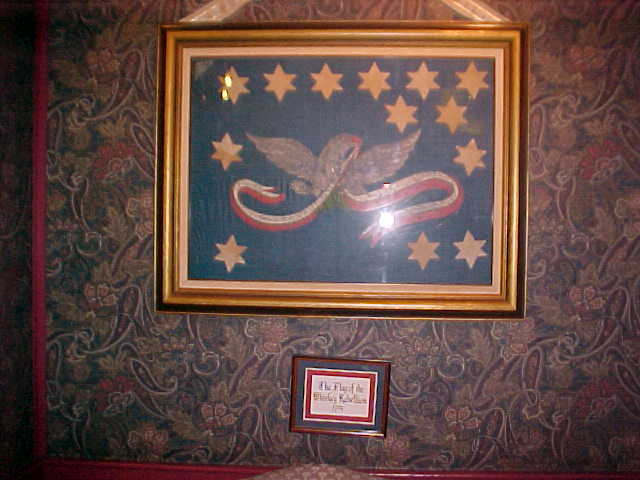 The inn’s place in history is emphasized by its prized possession- the only known flag in existence from the local Whisky Rebellion of 1794. I have not stayed here in a very long time, but recently had lunch. Food's OK. Nothing to rave about, but the atmosphere is what you'd expect- charming. It makes a nice first stop if you are embracing the scenic route. In the great meadows just beyond Scenery Hill, the French and Indian War held its opening acts in 1754 at Fort Necessity, now a National Battlefield with a new, well-designed visitors center. A quick detour off of the National Road lands you back in the twentieth century at one of America’s greatest private residences, Fallingwater. The Frank Lloyd Wright masterpiece was built in 1937 for Pittsburgh retail mogul, J. Edgar Kauffman as a weekend retreat- but this isn’t your average lake house! Fallingwater is a powerful and evocative place. The home is a study in the sublime. Highly informative, guided tours allow visitors to intimately experience the building’s nuances and the architect’s philosophy. Fallingwater’s modernity and innovation is overwhelming for the 1930s, especially given its relevance yet today. The house is built directly into the bedrock and utilizes many natural elements, but is most famous for overhanging a photogenic waterfall called Bear Run. Having been named to National Geographic’s ‘Top 50 Must-see Places in America’, Fallingwater is a Laurel Highlands destination in its own right. Practically neighboring Fallingwater is Kentuck Knob, a prime example of later Wrightian architecture known as Usonian. Unlike Fallingwater, it is perched high on a hill offering fantastic vistas of the highlands. It was built in 1954 for the Hagen ice cream family and is open most of the year, but reservations are recommended. Ten miles from Wright's iconic home is the world-class, five-star Nemacolin Woodlands Resort. Sprawling over 3,000 acres, Nemacolin has a little something for everyone, including an acclaimed spa; full-service activities center (complete with zipline, off-roading, & archery); private zoo; private fly-fishing lakes; equine center; and two championship golf courses- one being a traditional links course. Anyone fortunate enough to pilot a plane can bypass Route 40 altogether to make a grand entrance on the resort's private landing strip, but those of us resigned to wheels, can start the visit off right with valet service. And service is truly what Nemacolin is all about, which is obvious in the mile-long list of spa treatments and family-friendly activities available year round. Among my favorite things to do is just wander the halls of the connected hotels, checking out out the eclectic art collection (one of my favorite pieces is the shirt Elvis wore in Blue Hawaiian). enter your suite to the aroma of lavender and hibiscus; the bathroom strewn with flower petals and tea candles. Towels and champagne glasses artfully arranged. “Jeeves” will even pour a little bubbly, if you insist. All you have to do is hop in and simmer! Here’s to the good life in the Laurel Highlands, where national treasures, stunning scenery and luxurious accommodations are well-worth the three hour drive from Columbus.